'Mayor Pete' is having a moment — but can he win? Easter Day bomb blasts at three Sri Lankan churches and four hotels killed 310 people and wounded around 500, following a lull in major attacks since the end of the civil war 10 years ago. The explosions, some of which officials said were suicide bomb attacks, led to an immediate clampdown, with the government declaring a curfew and blocking access to most major social media and messaging sites. The three hotels hit in the initial attacks were the Shangri-La Colombo, Kingsbury Hotel in Colombo and the Cinnamon Grand Colombo. The border militia leader who was arrested in New Mexico over the weekend on weapons charges allegedly said that his far-right group was training to kill prominent Democratic figures because of their “support of Antifa. According to an arrest warrant for Larry Mitchell Hopkins, witnesses told authorities that he'd said the United Constitutional Patriots were training to “assassinate” liberal billionaire George Soros, former Democratic presidential nominee Hillary Clinton, and former President Barack Obama. The 69-year-old and his armed militia, which spreads conspiracies and searches for asylum seekers on the border, have been accused of illegally detaining migrants. Serbia on Monday said it will donate one million euros to help restore Notre-Dame Cathedral, after pro-government tabloids said the fire was "God's punishment" to France. The gift comes after two tabloids, Alo and Informer, said the blaze was divine retribution after Kosovo's flag was displayed inside the cathedral during World War I centennial commemorations in Paris last year. Serbia does not recognise the independence of Kosovo, a former southern province that broke away in a 1998-99 war. President Donald Trump's decision Monday to end six-month waivers from U.S. sanctions for five countries that have continued buying Iranian oil — the latest turn of the screw in his Administration's “maximum pressure” campaign against Iran — was met with predictable outrage from Tehran. In response to the sanctions, Greece, Italy and, Taiwan had stopped buying Iranian oil, but China, India, Japan, South Korea, and Turkey have continued to import Iranian oil. The economic pressure has reduced Iranian oil exports from more than 2.5 million barrels a day to less than 1 million, discouraged foreign investment, and sent the value of Iran's currency plummeting and inflation soaring. A ceremony marking the 20th anniversary of the Columbine High School shooting has ended with the names of 12 students and a teacher killed being read aloud, accompanied by the release of white doves. Frank DeAngelis, who was the school's principal during the 1999 shooting, said he begins every morning by reciting the victims' names. Saturday's ceremony ended a three-day slate of somber gatherings honoring the victims and lending support to survivors, the school and victims' families. A beautiful spring morning at the Topeka Zoo in Kansas turned tragic when a male Sumatran tiger attacked a keeper, inflicting wounds that sent her to a hospital. Although keepers are never supposed to be in the same space as the tigers, they found themselves together in the outdoor habitat that morning for reasons under investigation. "There's some sort of error that occurred here," said Brendan Wiley, the zoo's director, told a news conference. Tesla is reportedly looking into reports that one of its vehicles suddenly exploded in China. This comes the day before the electric car company is set to have a soft earnings event at its Palo Alto headquarters on Monday. Surveillance footage of the explosion out of Shanghai was posted on social media on Sunday. 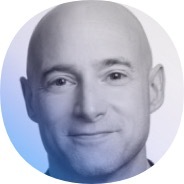 One of the operations most vital to Facebook Inc. at this moment is a world away from its Menlo Park, California, headquarters, and in more ways than one. This is Boom Live, one of seven tiny fact-checking firms at the heart of Facebook's efforts to rebuild some of its credibility during India's elections. Based on the early tallies, more than 60 percent of India's 900 million eligible voters are expected to cast ballots between now and May 19, as the center-left Congress Party tries to seize power from the right-wing Bharatiya Janata Party. Religious and world leaders have condemned a series of blasts in Sri Lanka that killed almost 300 people on Sunday, including dozens of foreigners - with British, Dutch and American citizens among them. Two Muslim groups in Sri Lanka also condemned the church attacks. The Muslim Council of Sri Lanka said it mourned the loss of innocent people in the blasts by extremists who seek to divide religious and ethnic groups. Who are Sri Lanka's Muslims? 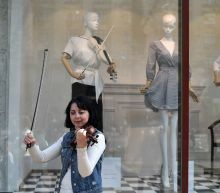 Anna, a 24-year-old from the government-held eastern port city, said her vote was going to Volodymyr Zelensky -- a comedian with no political experience who is the favourite to win the presidency. Anna said incumbent Petro Poroshenko, 53, had done "nothing tangible for us" after being elected shortly after a popular uprising in 2014. Others disagree, praising Poroshenko for securing an Orthodox Church independent of Moscow and containing the fighting in the country's east. As monthly apprehensions of illegal immigrants on the border hits a 12-year high, Chief Deputy Whip Dan Kildee urges comprehensive reform of the immigration system. U.S. stocks pulled back slightly on Monday as investors awaited a barrage of major earnings reports this week, the busiest this earnings season, while a jump in energy stocks kept losses in check. About a third of the S&P 500 companies, including Boeing Co , Amazon.com Inc and Facebook Inc, will report this week, determining whether investors should be concerned about the start of an earnings recession or whether back-to-back quarters of negative growth can be avoided. 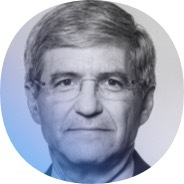 "Q1 earnings have largely been a pleasant surprise thus far, but have not ignited investor enthusiasm enough to move the needle in a meaningful way," Peter Kenny, founder of Strategic Board Solutions LLC in New York, wrote in a client note. President Donald Trump's lawyer Rudy Giuliani said there was “nothing wrong” with Trump's presidential campaign taking information from Russia in an interview on Sunday. “There's nothing wrong with taking information from Russians,” Giuliani said to CNN's Jake Tapper on State of the Union, days after special counsel Robert Mueller's report detailed more than 100 interactions between Trump's associates and Russians. In the interview, Giuliani was specifically responding to Tapper mentioning a statement tweeted by Sen. Mitt Romney (R-UT) on Friday. Help from Russia: Trump's lawyer says why not? 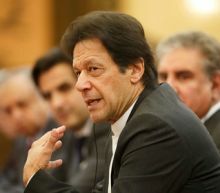 Pakistan's Prime Minister Imran Khan arrived in Iran on Sunday to discuss security and regional issues, Iranian state TV reported, a day after Islamabad urged Tehran to act against militants behind killings in Pakistan's Baluchistan province. A new umbrella group representing various insurgent groups operating in Baluchistan claimed responsibility for an attack on Thursday when 14 passengers were killed after being kidnapped from buses in the province, which borders Iran. Pakistani Foreign Minister Shah Mahmood Qureshi said on Saturday the training and logistical camps of the new alliance that carried out the attack were inside Iran and called for Iran to take action against the insurgents. Corrections and clarifications: An earlier version of this story mischaracterized Friday's sentencing relating to the number of children involved in the charges. RIVERSIDE, Calif. – The Southern California couple who pleaded guilty in February to torture, false imprisonment and endangering their children – some for dozens of years – were sentenced Friday to life in prison for charges involving 12 of their 13 children with the possibility of parole only after 25 years. David and Louise Turpin of Perris, about 70 miles east of Los Angeles, appeared in court Friday morning in Riverside about three months after pleading guilty to 14 felony counts. The B-21 has disappeared into the “black” world of military technology, and will only reemerge when the bomber is ready. On October 27, 2015, nearly thirty-four years to the day after Northrop Grumman was awarded the contract to develop the first stealth bomber, the U.S. Air Force awarded Northrop a contract for a new bomber: the B-21 Raider. In invoking the Doolittle Raid, the Air Force is drawing attention to attack's audacious nature, the strategic and tactical surprise, and the epic distances General Doolittle and his “raiders” flew to accomplish their mission. Dyson's newest cordless vacuum is the V11 and it costs as much as $700. If you don't need all of Dyson's new bells and whistles though, you can score a great cordless vacuum for a tiny fraction of that price. Amazon is running a one-day sale on Dyson V6 Motorhead Cord Free Vacuum refurbs for just $149.99, and they're of course guaranteed and warrantied. The Islamic State group Sunday claimed responsibility for an attack that killed 10 people and trapped around 2,000 for hours inside the communications ministry in the Afghan capital the previous day. Four IS jihadists detonated explosives near the ministry, then entered and "battled Afghan security forces with machine guns and hand grenades for numerous hours", the group said in a statement on its social media channels. The attack in central Kabul killed seven civilians and three members of the security forces, the interior ministry said on Sunday, in a new toll after three people died of their wounds. U.S. Rep. Seth Moulton is the latest Democrat to jump in the race for the White House. The Massachusetts lawmaker and Iraq War veteran made the announcement Monday. 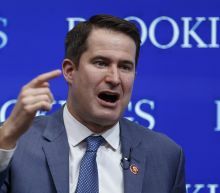 Moulton first came to prominence in 2014 when he unseated long-term incumbent Rep. John Tierney in a Democratic primary and went on to represent the state's 6th Congressional District, a swath of communities north of Boston including Salem, home of the infamous colonial-era witch trials. Amazon Deals | Walmart Deals | Apple Deals | TV Deals | Gaming Deals | Laptop Deals | iPhone Deals Good news if you want to upgrade your arsenal of gadgets on a budget this month. Retailers are currently offering a smorgasbord of spring deals with discounts on everything from laptops to game consoles. Google is celebrating the fourth anniversary of its Project Fi phone service by slashing the price of its flagship device in half. A comedian with no political experience won a landslide victory in Ukraine's presidential election, drawing congratulations from global leaders while dealing a stunning rebuke to his country's political establishment. 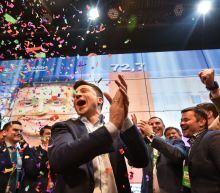 Volodymyr Zelensky, whose only previous political role was playing the president in a TV show, trounced incumbent Petro Poroshenko by taking 73.2 percent of the vote, according to nearly complete official results released early Monday. Poroshenko garnered just 24.4 percent, losing to the 41-year-old comedian and actor across the country, with 85 percent of ballots counted after Sunday's election. We remember when these models were new! Check out the significant milestone anniversaries these Land Rovers have for 2019 Four anniversaries sure to resonate with Land Rover enthusiasts the world over will be celebrated at the upcoming 2019 Land Rover Legends show. The event is due to take place over the weekend of Saturday 25th and Sunday 26th May at Bicester Heritage, a former WWII RAF station in Oxfordshire UK, which has hosted numerous historic motoring events in recent years.